Speaking of cows (and bulls) -- rodeo won’t be featured, although it was contested in conjunction with the Winter Games in Calgary in 1988 and Salt Lake City in 2002 -- you can enjoy all manner of equestrian events at the Will Rogers Memorial Center, including those showcased in the Summer Games: eventing, dressage and jumping. It&apos;s the only sport in which men and women compete against each other on a level playing field. Will Rogers has also hosted plenty of Golden Gloves boxing tournaments, and, indeed, Olympic pugilist and Fort Worth native Sergio Reyes fought there back in the day. Fort Worth also offers a number of boxing clubs for those wanting to get their fight game on. Speaking of combat sports, another native Fort Worth Olympian, Nikki Kubes, trained at the Fort Worth Judo Club in southwest Fort Worth. Across University Drive from Will Rogers, many a Fort Worth student has competed in track and field events at Farrington Field. Built in 1939, Grecian-style reliefs adorn its classic facade. Herman Clark Stadium on I-20 hosts plenty of track competitions, too, and it sits close by the Wilkerson-Greines Activity Center, home to basketball, volleyball, and aquatic events for the Fort Worth ISD. You might also consider taking in those sports at TCU’s Schollmaier Arena or University Recreation Center pool. The university has trained its share of medal-winning athletes in a number of sports. Fort Worth native Paul Gonzalez, in fact, played baseball at TCU and went on to represent the country of Australia as a naturalized citizen in 2000 in Sydney and 2004 in Athens. With baseball and softball out of the Games, Lupton Stadium may not produce any more Olympians, but Fort Worth might. Perhaps instead young gymnasts will have drawn inspiration from the recent Women’s Junior Olympic National Championships and NCAA Women’s Gymnastic Championships held at the Fort Worth Convention Center (FWCC). The FWCC Arena has also played host to a major international tennis event in 1992 when the United States won the Davis Cup. 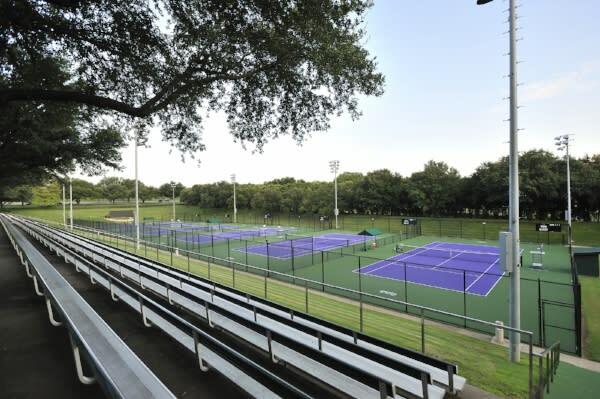 You can perfect your backhand at Bayard H. Friedman Tennis Center at TCU and the McLeland Tennis Center on Seminary Drive; both boast excellent facilities open to the public. Texan Jordan Spieth’s PGA Tour win in Fort Worth at Colonial Country Club’s Dean & DeLuca Invitational earned him points toward qualifying for the Games, though he declined the opportunity to go. Fort Worth has plenty of other excellent golf courses and ranges, including four municipal courses and the Leonard Golf Links. Marty Leonard runs the latter. Her father Marvin was a friend and business partner of Fort Worth great Ben Hogan. Hogan never competed in the Summer Games, with golf’s only appearances prior to this year having come in 1900 and 1904. Another sport making a return to the game after a long wait is rugby union, last played in 1924 in Paris. This time around, men and women will play the seven-a-side version of the game. You can join the scrum at the facility at Fort Worth’s Gateway Park. Right around the corner from the Gateway complex, you’ll find the Fort Worth Rowing Club. And for canoeing and kayaking fun, check out Backwoods Paddlesports at Panther Island Rentals for rentals year-round. You can ride your road bike to here from Gateway along the Trinity Trails. It might not be quite big enough for Chris Froome to lead a peloton down, but it’s a great place for you to get some pedaling in. Get some kicking in at one of Fort Worth’s many soccer fields. The Rolling Hills Soccer Complex offers lots of playing options, and you can see some excellent fútbol played at Texas Wesleyan’s Martin Field (home to the Rams and the Fort Worth Vaqueros) or TCU’s Garvey-Rosenthal Soccer Stadium.